One additional Gathering open to all parishioners will be held May 15-16, 2015. In addition, Futuring Committee members will be hosting some focus group sessions and also conducting some best practice research during the month of March. A final recommended plan will be presented by the Futuring Committee to the Pastoral Council for review, amendment and approval on June 4, 2015. An action plan (Goals, Objectives, Action Steps, Measures, Budget Implications and Responsibilities) will also be developed to assist with ongoing implementation and evaluation. Implementation will be for the five-year period beginning July 2015 and extending through June 2020. 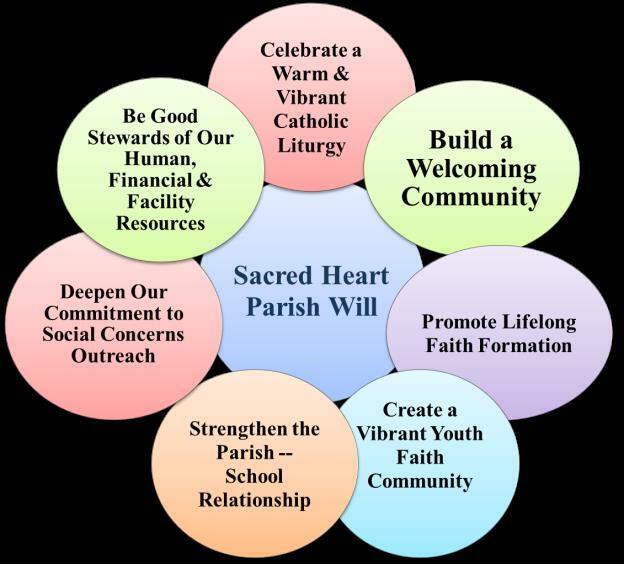 Why does Sacred Heart Parish exist? What is its identity and purpose? What makes the parish unique or distinctive? This statement is usually 30 words or less without jargon and is able to be recited from memory. * DRAFT SACRED HEART MISSION STATEMENTS – BASED ON CIRCLE MASS & GATHERING II INPUT. Option A - Sacred Heart Parish is a welcoming Catholic community which inspires our faith in God through prayer, sacraments and service. Together, we participate in and demonstrate our commitment to God. Option B - Sacred Heart Parish is a welcoming Catholic community which inspires our faith in God through prayer, sacraments and service. Together, we support all who hunger for understanding and seek healing, compassion and love. Option C - We at Sacred Heart Parish are a welcoming Catholic community who inspire our faith in God through prayer, sacraments and service. We celebrate our commitments to live Gospel values as faithful followers of Jesus Christ. * Are there any changes or additions you would suggest to one of the Mission Statements? These statements reflect the core values or key beliefs of Sacred Heart Parish. Values are important for a planning process because they are guiding principles of conduct. They indicate what an organization is willing to stand up for and are often implicit within organizations. They are most helpful when made explicit. Will living out these values help our parish faith community live out its mission and live into its vision? There are two lists of value statements below. The first list was created by Gathering I participants and edited by the Futuring Committee. The second list links the parish values with the school values. Please review the list below and check the box that reflects your opinion on these value statements. •	Faith: Believing all things are possible through God the Father, Son, and Holy Spirit. •	Hope: Embracing the future with confidence in God. •	Love: Offering support, acceptance, and compassion to all. •	Respect: Building relationships on trust, honesty, and integrity. •	Gratitude: Appreciating and stewarding the many talents and blessings we receive. * After reviewing and rating the Value Statements, are there any additions or changes you feel would be important? These statements are specific points that Sacred Heart Parish seeks to attain. Goals are long term in nature and do not usually change during a planning/implementation period. These seven goal areas were developed from input received at Gathering I and further conversation by the Futuring Committee combined with input from Gathering II. The circles below represent a pictorial image of how the goals are interrelated. Check the appropriate box for each goal. * Are there other goal areas that you feel need to be addressed? * Are there changes or additions that you would like to make to these goal statements? These statements answer the question, “What will Sacred Heart Parish need to do in the long term (goals) and short term (objectives) in order to live into its vision?” To be useful, objectives and action steps need to be SMART: Specific; Measurable; Achievable; Responsibilities Identified; Time-bound. The process of identifying specific action steps, measurables, and the people responsible for implementation is helpful as part of an internal management plan. These will be ready in draft form in April for review. Check the appropriate box for each Objective. A. Encourage full and active participation of the congregation in all liturgies while respecting the differences of how people want to worship. B. Provide formation opportunities for liturgical ministers. C.	Continue developing a strong music ministry, including multiple choirs. D.	Prepare and distribute a handout for first-timers or non-Catholics. A. Deepen the commitment to being welcoming and hospitable. B. Improve communication between and among all parishioners on matters impacting parish life. C.	Implement regular activities that integrate all ages. D.	Host community-wide events social and community building events. E.	Build a more diverse community that engages our ecumenical brothers and sisters. A. Encourage all to deepen their personal relationship with Jesus. B. Continue implementing meaningful children’s faith formation programs. C.	Provide nurturing intergenerational activities that will engage all ages. D.	Promote regional ministry to and with young adults. E.	Ensure strong adult education/formation opportunities. A. Celebrate a youth-led Mass. B. Offer social, educational and service opportunities for the youth. C.	Establish a youth advisory board and increase parent involvement in the youth programs. D.	Explore the feasibility of Confirmation timing. A. Foster community building opportunities between the parish and school. B. Improve faith formation in the school. C.	Provide increased prayer opportunities for school parents. D.	Support a children’s choir. A. Establish a Social Concerns committee. B. Explore the wants and needs of our parish and the surrounding community. C.	Increase our food services to shelters. B. Establish a Stewardship Commission to further develop the sharing of time, talent and treasure of the parish. C.	Develop new ways to communicate our financial needs and opportunities while increasing financial support for the parish. D.	Improve overall parish facilities to meet the needs of the community. E.	Explore the feasibility of building a parish hall.